Our Generation 2 A510P Offshore Safety/Dive Pro is a line-cutting workhorse used by professionals around the world. Forged from a single bar of our Pro-Grade German Marine Stainless. The Pro-grade German Marine stainless that we use is comparable to 440C for hardness and edge-holding properties with additional anti-oxidation elements added for the final crafting of our knives. Extreme strength and light weight. This modern upgrade features lighter overall weight, shackle slot in the bladeand improved lanyard attachment. It features the three most commonly used metric wrench sizes in the handle. For survival, the handle can be wrapped with 1/8" parachute cord. The Classic Sheepsfoot blade design is a modern version of the classic knives used by seamen for centuries. It includes our heavy nylon sheath with straps and grommets that allow the user to attach it to a belt in several ways or lace it to safety/flotation equipment in order for this important piece of gear to always be ready for use. Always rinse the knife and sheath with fresh water after using it in salt water. Remember: it's possible to make a "rust proof" knife, but the metal is always soft and unable to hold a good edge. We use our own Pro-grade German Marine Stainless that holds an excellent edge; however, it will show surface or cosmetic oxidation if not rinsed after use. This oxidation can always be removed with a stainless cleaner. 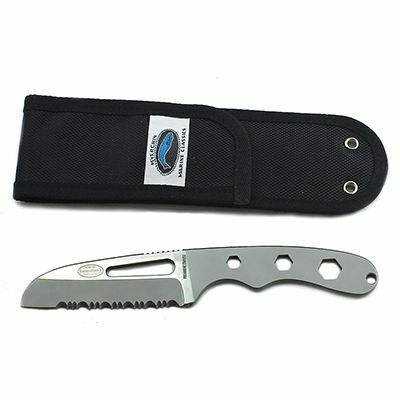 This knife features a 3/4 Serrated Blade.